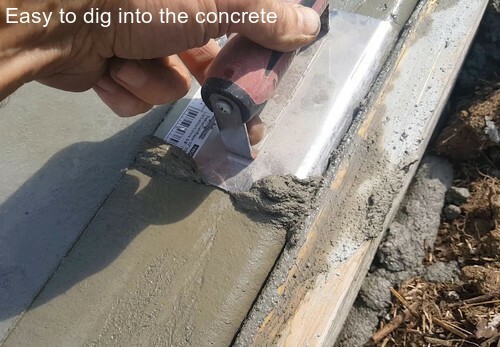 On this page I'm going to show you some concrete edging tools and tell you which one's are my favorite and which one's are not. There's so many different types of concrete edger's for sale. My goal is to help you choose the right edging tool based on my real world experience using them. 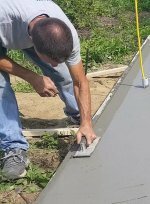 I'm Mike Day and I own Day's Concrete Floors, Inc.
My employee's and I use concrete edging tools on concrete slabs, concrete sidewalks, concrete pool decks, and concrete driveways. We use them just about everyday, so we know which one's are easier to use and which one's are well made. What's the reason for using a concrete edger? 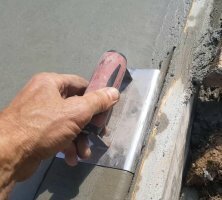 Using a concrete edger will give you a rounded edge along the outside edge of a slab, pool deck, sidewalk, or concrete driveway. By rounding off the edge of the concrete, it will be less susceptible to chipping. Leaving the tool mark from the edger gives your project a "picture frame" look, which in most cases looks more professional. There's basically two kinds of concrete edging tools. FLAT DESIGN CONCRETE EDGER - Where the front and back edge are completely flat. TAPERED DESIGN CONCRETE EDGER - Where the front and back edges are slightly tapered upwards. Both of these types of edger's can be a handheld design like in the pictures above. Or you can buy the walk behind edger with a handle attachment so you don't have to bend over as much. In my opinion, if you are in the concrete business, it's a good idea to have both the handheld and walk behind styles. I personally like the concrete edger with the tapered front and back edges. The reason for this is simple. When you move the edger back and forth, the tool doesn't want to dig into the concrete. You can hold the edger quite flat and get very good results. If your new to concrete or just learning, this is definitely the concrete edger for you to have. Click HERE to get my personal favorite concrete edger on Amazon. The flat edger tends to want to dig or scrape the concrete if you don't hold it up high enough while you move it frontwards and backwards. The tapered edger will not do this and makes for easy use of the tool. Here's one I recommend getting if you going to buy an edger. 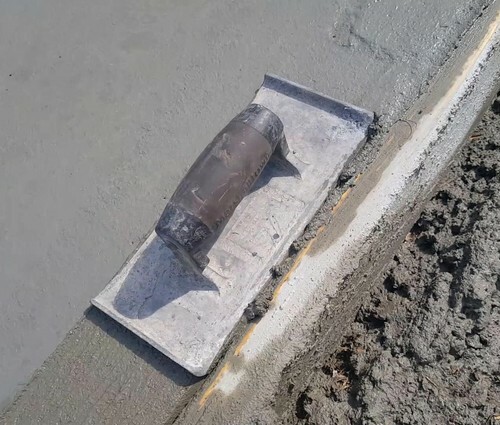 What are most concrete edger's made of? Stainless Steel - These are lightweight and usually less expensive than the others. Zinc - Heavy duty and long lasting, very good material for an edger. Bronze - MY personal favorite, Heavy duty and long lasting. Excellent for every day use. What brand of edger should I buy? I have 2 personal favorites when it comes to using concrete edger's. The first is Marshalltown's Concrete Edger's. Marshalltown makes a very good commercial grade edger. I highly recommend them. For the big bronze edger I like the one below. It's 9" long and 4" wide, this edger gives you a very nice picture frame look to patios, pool decks and driveways. For a smaller edger I like this 6" long by 2 3/4" wide one for edging door openings and garage door entry's. What is a walking concrete edger used for? 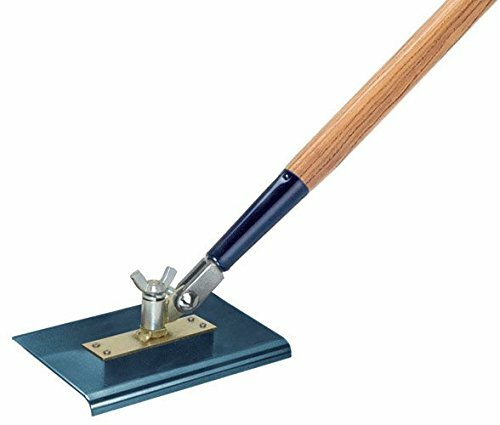 A walking edger, sometimes referred to as a concrete edging trowel, is used for the same things as a handheld edger except it has a handle so you don't have to bend over to perform the task. Walking edger's are great for long straight runs on patios, slabs, and driveways. The one pictured below is an excellent walking concrete edger you can get on Amazon. Don't forget to get the handle also. Look guys, there's a lot of very good concrete edger's out there. Which one is considered the best concrete edger? I can't say for sure, I can only give you my preference's based on my experience using the one's we use every day. Me and my crew like using the bronze concrete edges that have the tapered or flared front and back edges, plain and simple. We use one size or the other depending on what kind of project we are doing that day. If this is your first concrete edger purchase, you can't go wrong with a bronze edger. Zinc is very good also, I have a couple of these as well. Watch my video below to see how I use a concrete edger around a patio slab. This page includes affiliate links. When you click on any link from everything-about-concrete to Amazon or other affiliate sites and purchase a product, E-A-C receives a commission on the sale. It doesn't cost you a penny and helps support the site THANK YOU!